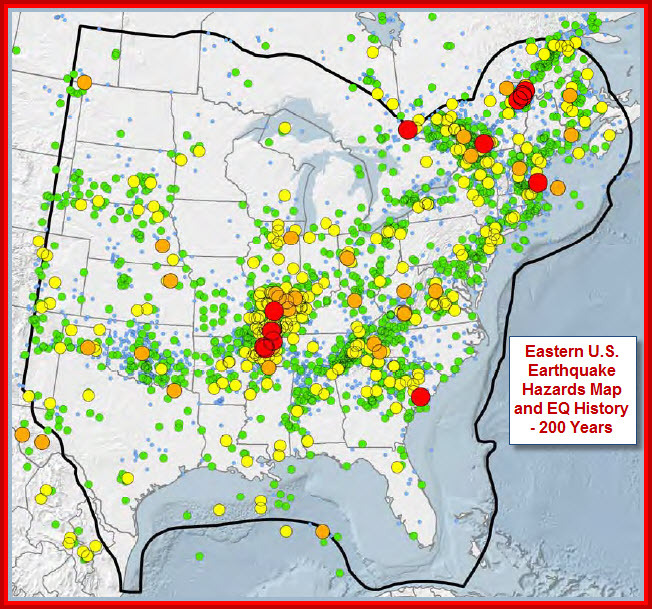 Eastern United States Earthquake History and Hazards Map. | Chaos Sweeps Away the World We Know! The Disaster, current events & Catastrophe Blog. Forecasts for 2014 to 2022. Read tomorrows news today! Plus current economic, commodities, stock indices and financial news. ← Song of the Day – The Wreck of the Edmund Fitzgerald. March 15, 2014 – Eastern United States Earthquake History and Hazards Map: A new map detailing all known geologic faults east of Denver was issued by the U.S. government and a nonprofit electric research group, opening the way for nuclear power plants in the United States to embark on a broad re-evaluation of their vulnerability to earthquakes. It was the first major update of the map since 1989. While researchers began the computer modeling for the map long before the earthquake and tsunami that caused last year’s Fukushima Daiichi plant disaster in Japan, that calamity lent urgency to a renewed effort to assess the American plants. Further concerns were raised by a quake last summer near Mineral, Virginia, which shook a twin-reactor plant there beyond the extent that its designers anticipated, resulting in its shutdown for safety checks. The study does not calculate the risk of damage from an earthquake or even specify what amount of ground motion is likely at the reactor sites, leaving that to their owners. “The model is the first step,” said Scott Brunell, a spokesman for the Nuclear Regulatory Commission. The computer model was developed by the Electric Power Research Institute, a nonprofit utility consortium, with help from the Department of Energy and the Nuclear Regulatory Commission. The map clearly shows the known earthquake hazards near New Madrid, Missouri and Charleston, South Carolina. What is surprising are the significant earthquake history and hazards near New York City and southeastern Canada. The size of the dots represents the size of historical earthquakes. The red dots are earthquakes >= 6.0 Magnitude. Click here for the complete study with over 185 detailed maps. This entry was posted in Canada, Disasters, Earthquake, Forecast, Mexico, Misc, Miscellaneous, Nature, New York City, News, United States and tagged charleston south carolina, Eastern united states earthquake history and hazards map, Electric Power Research Institute, Fukushima Daiichi, Fukushima Daiichi Nuclear Power Plant, Japan, new madrid missouri, New York, new york city, Nuclear power in the United States, Nuclear Regulatory Commission, southeartern canada, The Master of Disaster, United States. Bookmark the permalink. 1 Response to Eastern United States Earthquake History and Hazards Map. Wow! Look at that! Right in the middle of Texas. No earthquakes in 200 years! Location… Location… Location!! !